Dried apples are an autumn treat that everyone can make. Drying is the oldest method of preserving food. Ancient peoples didn't have refrigerators, freezers, tin cans or jars. They simply used the sun to dry fruits and meat for jerky. As the food dries, its natural sugars become concentrated and the flavors intensify. You don't have to add any sugar or fat. You can dehydrate all kinds of produce such as bananas, cherries, tomatoes, apples, plums and apricots. In order to safely dehydrate food, you need dry, controlled heat to force moisture from the food, and air circulation to carry the moisture away. When food is dehydrated, 80 to 95 percent of the moisture is removed, so bacteria and other spoilage microorganisms can't grow. But drying doesn't kill the microorganisms already present. The food can still spoil if not enough moisture is removed. An electric dehydrator provides the most reliable and consistent results for drying foods because of the controlled temperature and airflow. It's a simple, straightforward process: wash, peel, and pit the produce; cut or slice in uniform pieces. Dip fruits such as apples, bananas, and peaches in pineapple or lemon juice to keep them from oxidizing and turning brown. Then place them on the dehydrator screen. Cover with the lid and turn the dehydrator on. Dry until crisp and moisture is removed. Apples have been my favorite things to dry. It is easy to do and they last all year long — that is, if I dry enough. It is my favorite gift to give at Christmas. Not only are they healthy but, the work of preparing them is done in the fall. Here is what you will need to make apple chips: A dehydrator, apple peeler (it peels, cores, and slices all in one process), a large can pineapple juice, waxed paper or plastic wrap, a knife, and lots of apples. 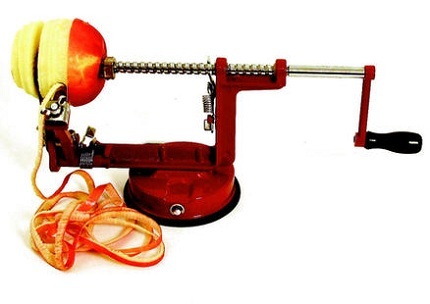 An apple peeler saves a lot of work. The dehydrator that I use has 10 trays. The first step is to wash the apples and set up the apple peeler. Spread waxed paper or plastic wrap on the counter and pour the pineapple juice into a bowl. Set up your work station so you can peel the apples, dip them in pineapple juice, and place them right on the dehydrator trays. Place the stem end of an apple into the three prongs of the peeler arm. Turn until the apple is peeled, sliced, and cored. Set the apple on the tray, and with the paring knife cut a slit in the apple all the way to the bottom. Now place the apple slices into the pineapple juice, making sure all slices are covered, as this will keep them from darkening. 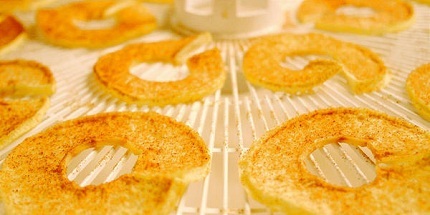 Put the individual slices onto the dehydrator tray. As you fill a tray, place it on the dehydrator. Once all the trays are filled and in place, turn the dehydrator on. My dehydrator takes 6 or 7 hours to dry apples. At 3 hours, I open the dehydrator and turn the apples over tray by tray. This keeps them from sticking to the trays once dried. 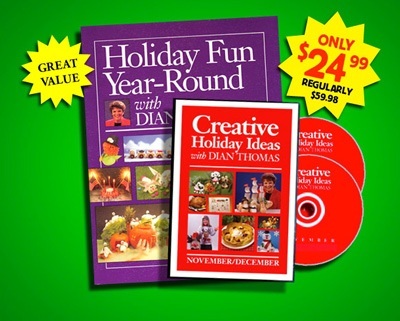 This special offer includes Dian Thomas's Holiday Fun Year-Round book plus her NEW 2-DVD set, Creative Holiday Ideas with Dian Thomas. You’ll love the holiday ideas in the full-color book (nearly 200 pages). See the best of Dian’s ideas on the DVDs from her 30+ years on national television! Her warm, energetic personality comes to life on your screen. Regular $59.98, this package is being offered for the holidays at only $24.99 — just in time for the holidays. Don’t miss this opportunity to create some lasting memories that you’ll cherish forever.